PHOTO BY MATT DETURCK Rhythm Tap at RAPA. I'll admit, as a lifelong tapper, I had lofty expectations for "Rhythm Tap" at RAPA Wednesday night. The art of hoofing is often lost this day in age - and I'm thrilled to say that in William "Bill" Evans and Cheryl Johnson's performance, it's been found again. The duo's 50-minute Fringe Fest show is a fun, well-paced cross-section of rhythmic tap history that's easily accessible even to the non-dancer. The pair start the evening with the roots - a sand dance ("Danzon A La Playa"). It's similar to that scene in "History of the World, Pt. 1" with Gregory Hines, but less about the jokes and more about the intricate rhythms the two dancers pound out on the barren stage, covered in two small piles of sand. The piece, set to an original composition by pianist Richard DeLaney, starts slow and simple, but really cooks toward the end. 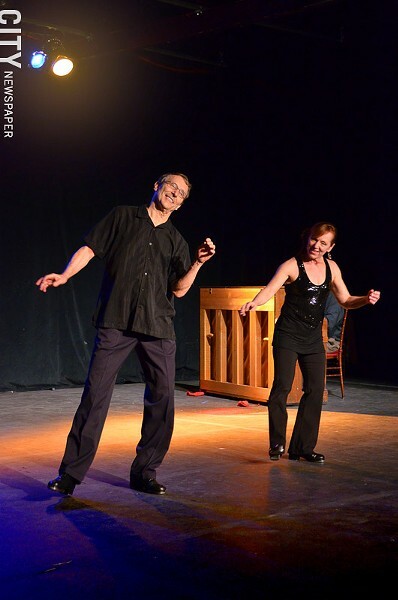 Bill Evans and Cheryl Johnson in Rhythm Tap at RAPA as part of the Rochester Fringe Festival. Between performances, while the dancers change their shoes and catch a breath, they give nods to the greats before them: Leon Collins and Buster Brown in particular. That's the idea behind Johnson's solo piece "Footprints." I was a bit skeptical when she started putting socks over her tap shoes, but she stomped out every note with precision and a certain tenderness that really worked. About halfway through the piece, she kicked off the socks and picked up the pace - and she was on fire -- tapping, twirling all over the stage. Every so often, she'd go to the mic to sing a few notes. And while her voice was fine, it sounded a bit forced and I didn't think the singing enhanced the performance. You don't have to be a song and dance man, so to speak. Johnson felt much more natural when she was tearing up the dance floor (and she really does). For his solo, Evans paired classic tunes ("Three Preludes" by Gershwin), with an unconventional mix of tap and modern dance (he has a background in both). The result wasintriguing. It's hard to describe - because I've never seen anything quite like it before. At times, Evans' movements feel slightly laborious, but it almost didn't matter. The grin he was wearing from ear to ear is a wonderful reminder to the audience of what dance is really about: having fun. And he clearly does. The pair brought it home with "Laura," a piece known to hoofers by Buster Brown. And although most performances are set to the song of the same name, Evans and Johnson perform their last piece a cappella, with stunningly effective results. The crispness of their toe taps and heel drops and every intricate beat in between sent rings throughout the theater. Johnson pulled off a masterful move where her legs appeared to be spinning around and around like a cartoon character getting ready to run away. I'm still not sure how she did it. The result is an entertaining introduction to the world of tap that will have audiences tapping along and falling in love with lost (now found) artform. "Rhythm Tap Rochester" has one final performance on Friday, September 27, 5-6 p.m. at RAPA's East End Theatre. Admission is free, but seating is first come, first serve. 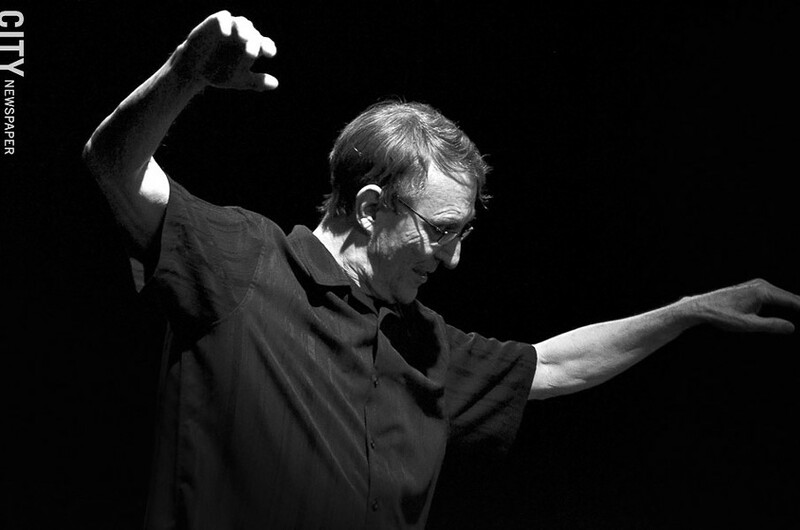 Bill Evans in Rhythm Tap at RAPA. There isn't a better venue at Fringe Fest for the short play "12 Dollars" than Acanthus Cafe. Not only does the coffee shop serve as a backdrop for the characters' argument over favors owed, friends and foes past, and who they really care about, but its intimacy makes the emotions of the characters that much more raw and immediate. Two men, one older and one younger (played by David Byrne and Mohammad Seraji), confront one another over the titular $12 and an insult directed at one of their late loved ones. But as their fight escalates over what to do about the slight, we quickly realize it's about more than the money and the insult, as the duo explores what they really mean to one another and why they even showed up there in the first place. The fast-paced, fascinating drama is smartly acted, well written, and offers insight into how we handle our own close relationships. Sadly, after the Fringe Fest closes down, so does Acanthus. The café will shut its doors after Saturday, a little over a year after opening up in the East End. I only wish I had discovered its friendly vibe and scrumptious brownie sundae sooner, and that it could stick around to serve as a backdrop for future Fringe Festivals. The final performance of "12 Dollars" will take place Friday, September 27, at 10 p.m. at Acanthus. Admission is free, but seating is limited.